The Ecosmart 4 in. Recessed LED Trim with clean and elegant design is ideal for glare free lighting in any room of the house. This CUL classified high efficiency dimmable Trim has received ENERGY STAR Certification for year-round energy savings. Compatible with dimmer switch for different illumination needs and increased energy saving. This LED Trim is for use with 4 in. IC recessed housings and will retrofit 4 in. incandescent housings to energy saving LED down lights. Reduce energy consumption to 9-Watt LED - comparable to BR30/65-Watt incandescent bulb. No More Cans!! The new Canarm LED recessed line features revolutionary recessed lights that are decorative and affordable . These are all ENERGY STAR certified to save you energy and provide more efficient recessed lighting options. These fixtures take up little space but offer ample lighting. Available in 3 inch, 4 inch and 6 inch sizes in white or brushed nickel and in round and square designs, one of these will definitely suit your needs. It's ideal in bedrooms, living rooms, kitchens, hallways, bathrooms, closets and basements. You can control Commercial Electric Smart LED Downlights from anywhere using an easy Wink app (Wink hub sold separately). Dim or adjust the colour of the light in a range from warm white light (2700k CCT) to daylight (5000k CCT). Also, the lights can be grouped, scheduled to turn on/off, or programmed to dim or adjust colour. Each cUL rated 10 watt LED recessed light produces 600 lumens, but uses 84% less electricity than incandescent or halogen bulbs. Over the life of each downlight, you can save as much as $303 in energy costs. Plus, with an integrated LED module, no replacement bulbs will ever be needed. These LED recessed downlights are certified AirTight, IC rated for direct contact with insulation, and wet rated for use outdoors or in showers. Globe Electric's 4 inch LED IC Rated Flush Round Trim Recessed Lighting Kit with tempered frosted glass and a glossy white finish is the perfect way to brighten up the interior of your home or commerce with style. The included LED bulbs turn your recessed lighting eco-friendly green. Featuring patented PUSH-N-CLICK clips which are fully adjustable and extra wide to grip uneven surfaces and provide easy tool-free installation. The frosted glass emits an indirect glow perfect for bright mood lighting. An integrated cut-off switch ensures that the fixture will not overheat and can be used with or without an insulation box. Includes one 6.5-watt GU10 bi-pin base MR16 LED bulb. Dimmable with a compatible dimmer switch (not included). Cut a 3.88-inch hole for this item. Actual decorative trim size is 4.25-inches. 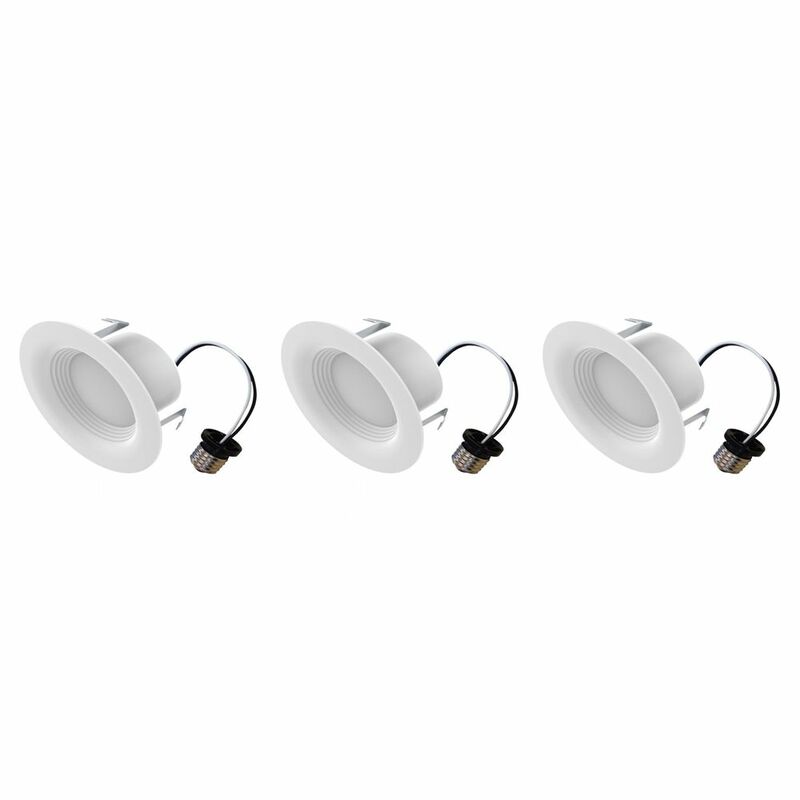 4-inch 65W Equivalent Bright White Integrated LED Recessed Trim Light (3-Pack) - ENERGY STAR The Ecosmart 4 in. Recessed LED Trim with clean and elegant design is ideal for glare free lighting in any room of the house. This CUL classified high efficiency dimmable Trim has received ENERGY STAR Certification for year-round energy savings. Compatible with dimmer switch for different illumination needs and increased energy saving. This LED Trim is for use with 4 in. IC recessed housings and will retrofit 4 in. incandescent housings to energy saving LED down lights. Reduce energy consumption to 9-Watt LED - comparable to BR30/65-Watt incandescent bulb.